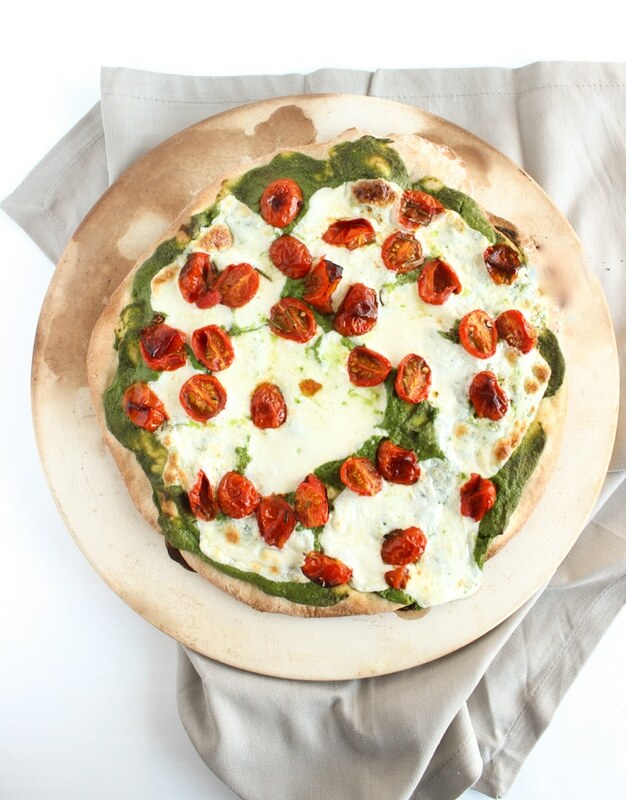 Top whole wheat crust with nut-free kale pesto, rosemary-roasted tomatoes, and fresh mozzarella for this delicious and healthier Rosemary-Roasted Tomato Pesto Pizza. Pizza is a favorite food of almost everyone I know. My husband always says he would be a happy man having pancakes or French toast for breakfast, bagels for lunch, and pizza for dinner. We all know that’s not exactly the most balanced diet, which is why it’s a rare occasion he gets all three of those in one day, but the point is these are foods most people can’t resist, and why should they?! All of them can be included in a balanced diet when made in a healthier way. That means using whole grains, adding vegetables and fruit, and adding a satiating protein source. These days many pizza parlors offer whole wheat crust and loads of toppings to choose from, which makes it much easier to make pizza night a healthier meal that can be enjoyed more often, especially when paired with a salad. And while it takes no effort to click a few buttons to place a takeout order online, it’s also quite easy to whip up your own pizza pie at home. Plus, making pizza as a family is so much fun – the kids can take turns rolling out the dough, spreading sauce, and adding their toppings. Not to mention that you can make sure everyone has a slice of his or her choice – every eighth of the pizza can have a different topping if you want. There’s no need to be a short order cook, which you know I don’t allow in my house and don’t recommend for yours! There are so many ways to top pizza and this Rosemary-Roasted Tomato Pesto Pizza is just one variation. I love a basic margarita with tomato sauce, mozzarella, and fresh basil, but I also like to keep things interesting with different sauces and toppings. 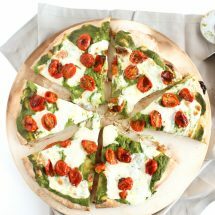 There are four main components to this pizza – the crust, rosemary-roasted tomatoes, pesto, and cheese. I use pre-made whole wheat pizza dough, which you can find in the refrigerator section of most grocery stores. I happen to like the one I find at Trader Joe’s, but there are definitely others you can find. This pre-made dough is very easy to work with, and one package (16 ounces) is enough for two pizza pies, so you’ll see I only use half the package in this recipe. You can make both pies at once and top them differently, do two of the same, or save the other half of the dough for another time. It freezes well. After I roll the dough into my pizza pie shape (you can make whatever shape you want), I like to bake it for a few minutes before adding the toppings. This ensures the crust is crispier, which is how I like it! If you want to make your life easier or just don’t want to roll out the dough yourself for whatever reason, you can also use a pre-made whole grain pizza crust or lavash flatbread as the base of the pizza. These tomatoes are packed with flavor and super easy to make. Just slice cherry tomatoes in half lengthwise, toss with olive oil, freshly chopped rosemary, and salt, and roast for 10 minutes. These tomatoes are very similar to the Rosemary Garlic Roasted Tomatoes I make as a side dish – they are so yummy! If you don’t have fresh rosemary, use 1 teaspoon dried. 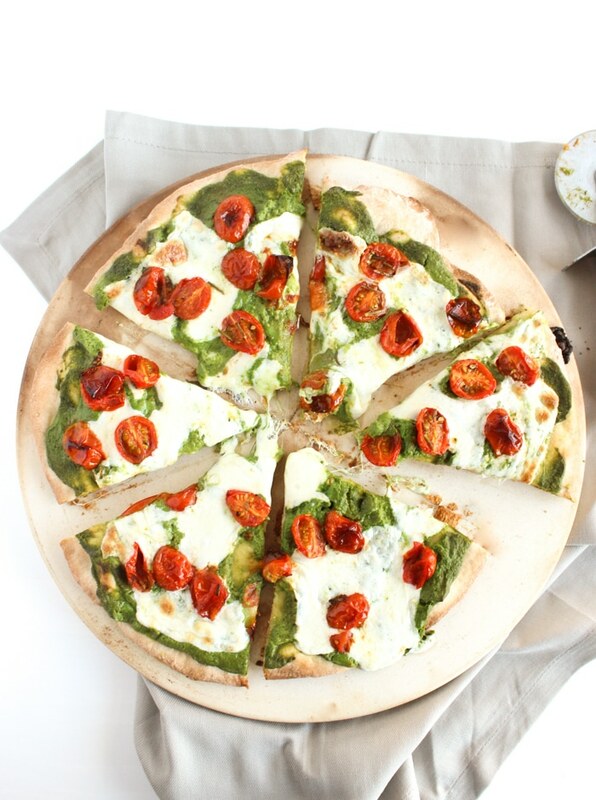 Instead of traditional tomato sauce, I make a lightened-up kale pesto as the base of this roasted tomato pesto pizza. The pesto is a little different from most traditional pestos (and different from other kale pesto I’ve made before) – it’s made with kale instead of basil, is completely nut-free, and is made with part-skim ricotta and just two tablespoons of Parmesan cheese instead of all Parmesan. This pesto recipe makes about 2 cups, which is more than you need for one pizza pie. Save the rest for another pizza (like this Mushroom Pesto Pizza) or to top pasta – it can be refrigerated for about a week or frozen for a couple of months. Feel free to use pre-made pesto to save time in the kitchen – Trader Joe’s has a delicious traditional basil pesto you’ll find right near the pre-made pizza dough. For this pizza I use an 8 ounce ball of fresh mozzarella cheese (not the part-skim low-moisture mozzarella), which I find in the cheese section of Trader Joe’s. I slice the ball of mozzarella into medallions, but you can also cube it or if you prefer shredded mozzarella that works just as well too. Once all the components of the pizza are ready, all you have to do is put the pizza together. Spread about 1/2 to 3/4 cup of pesto on the par-baked crust and top with the mozzarella medallions and rosemary-roasted tomatoes. The pizza bakes for about 12 minutes, which is just enough time to put together a side salad to round out the meal! This pizza is a delicious dinner for any night of the week, Sunday dinner with the family, or any movie night or TV watching gatherings with friends (think Super Bowl and the Oscars). This Rosemary-Roasted Tomato Pesto Pizza is made on a whole wheat crust and topped with a nut-free kale pesto lightened up with ricotta cheese, rosemary-roasted tomatoes, and fresh mozzarella cheese. A delicious and healthier way to enjoy pizza night at home. Preheat oven to 400 degrees F. Line a baking sheet with aluminum foil and toss tomatoes on it with olive oil, rosemary, and salt. Roast for 10 minutes, stirring halfway through. Prepare a pizza stone or round pizza tray. If using a metallic tray, coat with oil or cooking spray. Spread about 1/2 to 3/4 cup kale pesto on lightly-cooked dough. Top with mozzarella medallions and rosemary-roasted tomatoes. Return to oven and bake 12 minutes until the dough is fully cooked and cheese is melted and starting to brown and bubble. Slice into six or eight slices and serve hot. Roasted tomatoes are one of my favorite treats! What a great idea to throw them on a pizza – and with pesto – YUM! Thanks Amari! I can eat the roasted tomatoes just by themselves – they are so good! Two great pizza, Jessica! I’d love to try both! Thanks Cindy! I’m posting the mushroom one today! I’ve still never made kale pesto. Gotta make! Especially because it would make an amazing pizza…thanks for the great idea! I can’t believe you haven’t made kale pesto yet! I’ve made it a few different ways, but I think this is my fave! I love your kale pesto. Good nutrition meets awesome flavors in your pizza. I want a bite now! Kale pesto sounds amazing! These look great! Thanks Kristina – it’s super yummy! This pizza looks great. I love the combination of kale and tomatoes! Love Trader Joe’s Whole Wheat Pizza Dough – confession one time in school when we had to make food and take pictures of it for a class I was in. I made “pizza dough” from scratch but really bought the whole wheat dough from Trader Joe’s. I’ve got to try pesto though, yum! That’s a hilarious story – did the teacher find out?! LOL The pesto is super yummy. I do like making my own, but it’s definitely helpful when you want to save time! I am always looking for any way to eat pizza! Well here you go! Hope you enjoy this way! I LOVE mushrooms on pizza too – and have another pizza recipe with them coming soon. stay tuned!! Thanks so much Deborah! Hope you enjoy! I’m all about the pesto pizza! I often do a chicken one on naan with pesto, ricotta and mozz. So good. I don’t mix meat and dairy in our house (we keep kosher), but that sounds so delicious Chrissy! I can’t wait to try this pizza out at our next pizza night at home! I am loving that kale pesto sauce! This looks really great. I do like the idea of pizza at home. I’ve tried making whole wheat crust myself and it didn’t seem to go well. Or maybe I just didn’t like the pizza sauce I made from the garden tomatoes. Either way, I need to give it a go again. Thanks Chrissy. Sorry to hear your homemade version wasn’t so great. I say try the prepared dough with your own sauce or your own dough with prepared sauce, or prepared sauce and dough, lol! You can never have too much pizza when it’s healthy like this! Now this is an award-winning vegetarian pizza! I love pesto and roasted tomatoes on pizza. Looks SO flavorful! Love the addition of pesto! It is! Thanks so much Tara! Full of taste and nutrition. Looks great. Easy too. Thanks – it sure is delicious, nutritious, and easy!!! Wow! This looks fabulous!! Love a good pesto anything! Thanks so much Mikki! Hope you give it a try! This sounds like a tasty alternative to the average slice! 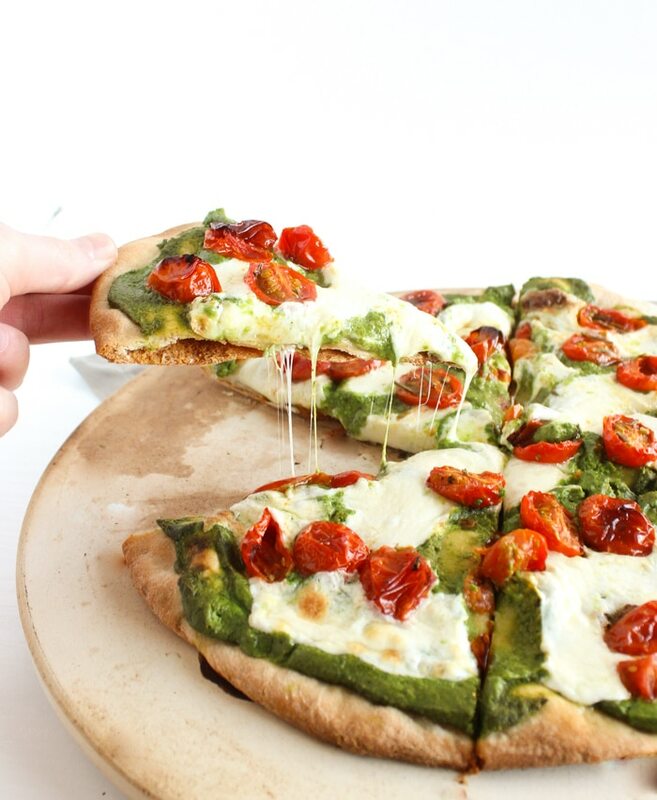 I love the idea of pesto on pizza! Thanks so much Sonali! The pesto is a nice alternative to marinara! Looks delicious! Now I’ve got a plan for that Ricotta in my fridge!! 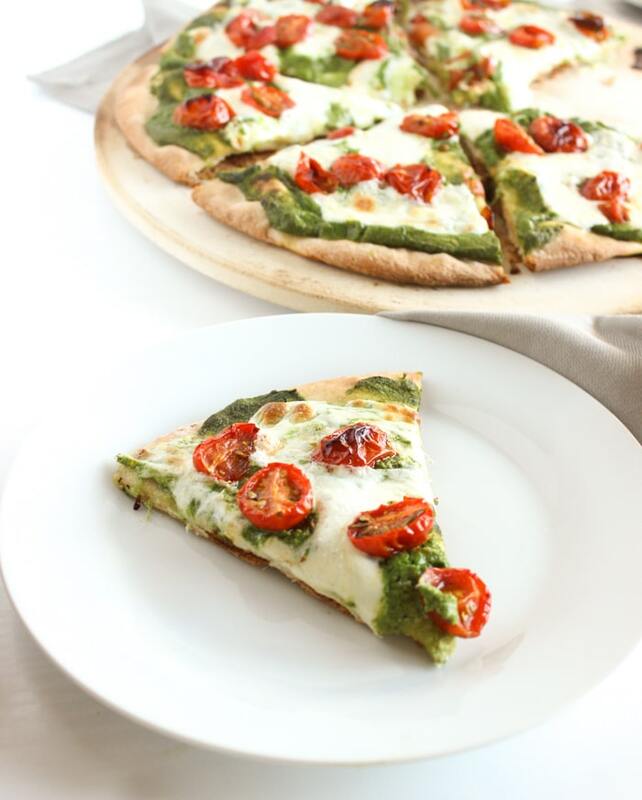 Pesto is definitely one of my favourite sauces, especially on pizza!! I had to come back to take a look at this recipe again. I love how you made it so easy for anyone with options to make your own pesto, or buy store bought. Either way its healthier than ordering delivery! And the round up at the end of this post…pizza lovers rejoice! Thanks so much Abbie! Hope you give it a try!